Richard Kirshenbaum—In my new book, “Isn’t that Rich? Life Among the 1%,” most of the chapters take place in glamorous places such as Capri, Malibu, Barcelona, and St. Barts. Clearly, the rich and famous live a life filled with glamorous international travel, but how does one do it if they’re the 99%? Here are a few tips I learned that allowed me to travel and live the 1% lifestyle on a 99% budget. June in Saint-Tropez, July in Capri? It sounds glamorous and it is, but most people don’t know that one of the best months to travel is September, when the 1% summer crowds have left. Hotel rates go down dramatically in September and October as the crowds depart, but the weather is still beautiful. So experience an Indian summer in Positano for less. The best bargain of all is the Caribbean in the summer. St. Barts is just as beautiful and chic, and it’s a bargain compared to Christmas vacation! Sure, it would be alluring to stay in Grand Hotel on the Riviera or the Amalfi coast, but the best news is that many hotels in Europe (as opposed to America) are former mansions or villas. And if a hotel doesn’t have a pool or hairdryers in the room, they generally cannot claim five-star status. That’s good for you because you can stay where princes and princesses have slept for half the price of a grand hotel. And trust me, the view and the elegance is just as grand. You don’t have to stay at a luxury hotel and pay the high prices, but all the five-star European hotels have glamorous restaurants and fabulous pools. So if you want to experience the 1% Grand Hotel that has seaside pool, all you have to do is make a lunch or dinner reservation. For the price of a meal, you can enjoy the same view and amenities as the super rich. In places like Rome, one can also buy a day pass to use a pool and have an al fresco lunch. So break out your blue blazer and white pants, and pass for a shipping tycoon — even if it’s just for one fun day. When I was on a copywriter’s salary and went to Italy, I couldn’t afford three expensive meals out, so I chose lunch or dinner. Breakfast was included in the bed and breakfast bill, so a cappuccino and a croissant got me through to either a wonderful lunch or a glamorous dinner. The other meal was getting a slice of pizza or a bowl of simple aglio olio pasta in a very inexpensive pizzeria. In places like Italy, the food is amazing everywhere, and there is nothing better than a slice of two of real Neapolitan pizza. So average out the costs of your meals and you can eat like prince or principessa. Related: Is Harbour Island the New St. Bart’s? 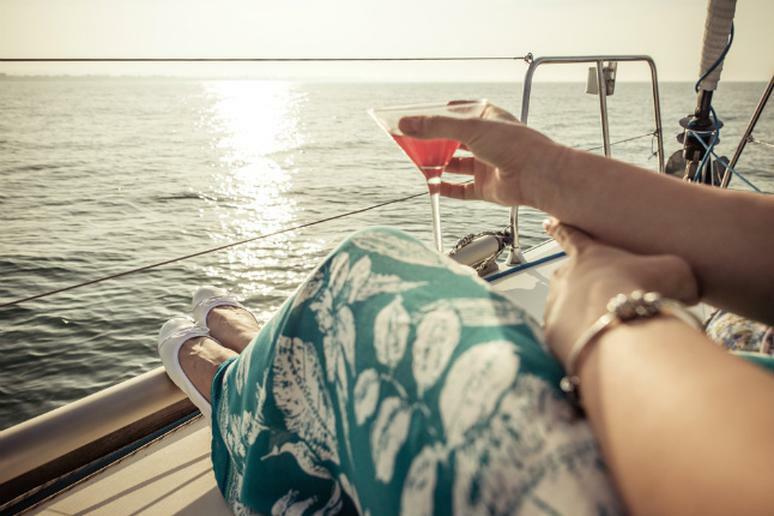 You may not have a driver or a yacht, but that doesn’t mean you can’t enjoy the sun on a public hydrofoil to Capri or see the countryside while eating pate and drinking wine on the best rail system. In Europe, the trains offer bottles of vino and fromage (cheese), so whether you are going coach or first class on a train, get a window seat and watch the beautiful countryside pass you by. Why fly from Madrid to Barcelona when you can take the scenic and less expensive train system? So whether you are the 1% or not, being rich is being smarter! Can Meditation in Bali Cure Anxiety-Ridden Americans?